Pacific Nanotechnology, Inc. is a company that develops and sells atomic force microscopes. It's located in California and has a network of distributors all over the world. Company's production is optimized for research of the nanotechnology topics using state of the art equipment. The use of AFM (atomic force microscopes) is especially important for 3D visualization of nano-objects. While working on their website we had a very clear task  develop a radically new version of the older website. The complexity of the task lied in the need of refining the company's look on the Internet. The focus of project was on making new website very easy to navigate. It also had to be practical and easy to manage later on. Another criteria was creating pages that would look equally great on both monitor and print-outs. New design was dynamic and easy to change at the same time. Light, non-heavy colors added a feeling of visual spaciousness, which helps people to get information from it and feel relaxed. Another thing worth mentioning is that this website consists of 2 subsystems. First is the website itself, and second part is our Content Management System (CMS) that helps company's representatives to get full control over their new website with the set of powerful tools we've provided. Beside the information on services and products, you can access the database of different companies, located in Vinnitsa region. If you're interested to list your company in the database, you can do it directly from your home on the web-site's automated online registration system. The front page of advertising calendars, which were made for introducing and marketing the services of the internet provider VinNext for the visitors of Ukrainian Regional Advertising Expo 2002 (Vinnica, Ukraine). Design was made in accordance with our client's wish, and based on their corporate identity style, which they used in all their marketing. When designing the calendar, we've put our emphasis on the fact that VinNest is that connecting link, that will transfer people to the world of information and technology  to the world of future. And the first step to that future would be with VinNest. Marketing handbill, developed for visitors of Ukrainian regional advertising expo in 1999 (Vinnica, Ukraine). 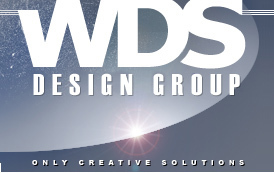 We've included information about different services that WDS Design Group offers on the regional design market. Advertising booklet was developed for black&white, one-sided printouts in A5 paper size format. Booklet was developed in accordance with WDS Design Group indentity style in that period of time.